A very healthy and quick lunch idea recipe for the entire family. Try zucchini patties. My recipe: grate 2 zucchinis and 1 small onion and squeeze all the excess liquid. Add about 1 cup chopped cilantro, 2 tbsp white flour, 2 egg whites or 1 whole egg, salt/pepper. Mix. You wont be able to shape patties, you will need to spoon them on the pan. 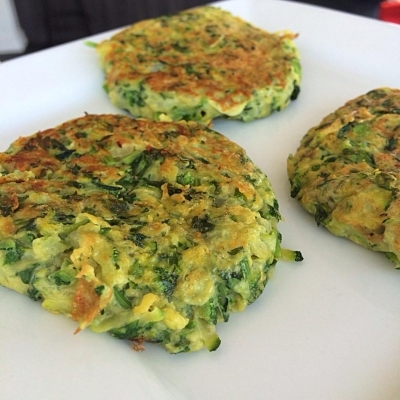 Heat the pan and drizzle with 1/2 tsp olive oil and spoon the patties. Cook on relatively low so patties can cook through. Flip and cook the other side too. They will hold the shape really well. Enjoy with some greek yogurt on top and your choice of protein.